Even a historic food product like pasta follows modern markets, like those of pre-cooked and gluten-free pasta. Advances in technology have allowed even small pasta manufacturers to extend their production range, thanks to multi-format lines and superimposable machinery, when space is limited, while appropriate handling is ensured by increasingly high-performance conveyor belts. Pasta manufacturing companies require lines, plants and machinery for producing dry and fresh pasta that ensure ease of use and technological and mechanical reliability, in addition to the flexible production of several types of formats, thanks machine modularity. Special attention is also paid to electrical and thermal energy consumption and, obviously, also to organoleptic characteristics, colour fastness and cooking times of the pasta that is produced. The novelties in the sector lie mainly in multi-format lines: those for producing pre-cooked or instant pasta and those for gluten-free pasta, which are two fast-growing markets all over the world. Multi-format lines allow the production of many formats of short and long extruded pasta, pasta sheets for lasagne and cannelloni, stuffed pasta, tagliatelle, pappardelle, tagliolini and spaghetti, on the same line, with different production capacities. These solutions are ideal for producing a wide range of pasta formats with a small footprint, together with the possibility of changing the type of production extremely quickly, without having to disassemble mechanical parts or move the manufacturing machinery. Thanks to specific accessories, special cutting devices and complementary machinery, in addition to standard short pasta sizes, you can also produce special formats. All the production phases are automatic and the modern multi-format lines can be managed by the PLC installed on the control panel, on which the recipes, formats, record reports of any problems and plant stoppages are loaded. When space is limited, pasta factories do not necessarily have to opt for multi-format lines, they can also choose combined super-imposed machinery or machines for pasteurising, drying and cooling pasta products. The market offers superimposable machines as an alternative to conventional solutions, which entail a series of machines that are arranged in line, each designed for a specific treatment, with their related space problems. Other machinery, besides being superimposable, seamlessly performs many of the pasta production processes. It is therefore possible to install a single machine to pasteurise, pre-dry and cool-fresh pasta. In Italy and all over the world, ready meals are increasingly eaten by many people, for practical reasons and above all because people have ever less time. As for all ready meals, the pre-cooked pasta market is also growing and Italian pasta production companies are equipping themselves with the necessary equipment. In fact, there are now complete lines that produce pasta in just a few minutes. Manufacturing companies offer complete ranges of machinery for producing pre-cooked pasta, which include automatic mixers, extruders, sheeters, dies, immersion cookers and coolers, oilers, tunnel or spiral dryers and coolers. Technological attention is focused on pre-cooking processes carried out in companies, which by means of a gelatinising system ensure a homogeneous product and prevent overcooking. After being shaped, the product is conveyed to a cooker, where it is partially cooked to speed up the preparation of the dish by the end consumer. In the cooker, the pasta can be immersed several times in boiling water, depending on the size and type of product to be processed. The machinery is entirely in stainless steel, with conveyor belts that regulate the permanence of the pasta inside the cooker, and it is isolated from the external part to allow a higher yield. The water can be heated by means of a series of steam-heated pipes positioned in the cooker or with an external heat exchanger or even by electrical resistances. The modern cookers are controlled by a PLC, which controls the water temperature and its re-circulation, as well as the speed of the belt. On leaving the cooker, the product is cooled in water by means of an immersion cooler. The pasta passes inside a stainless-steel tank full of water, thanks to a conveyor belt located inside the tank itself. It is then washed and cooled for the appropriate time, depending on the type of product to be treated, and subsequently transported to the exit of the immersion cooler. 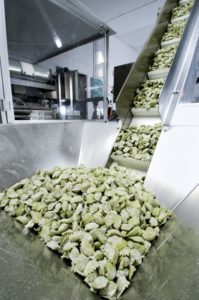 If it is necessary to complete the washing to remove starch residues, at the exit of the cooler there are nozzles that spray further water on the product. The water present in the cooler is continually regenerated, kept clean and at the pre-set temperature. Sometimes, after this operation, the pasta is treated with an oiler to keep it soft and prevent it from sticking. 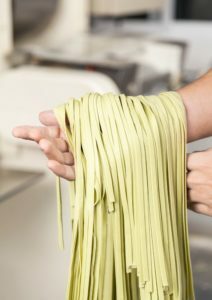 As in the case of traditional pasta, drying can be performed in static drying cells, for small productions or on a continuous basis, for larger productions. In any case, the cells are insulated and ensure that the product is insulated from the external part to allow drying even at a high temperature. They can be modular, as the trays positioned at different heights can be adapted to all types of pasta, even large formats. The pasta can be packed in packets or bowls made of plastic material. It is also possible to mix the pasta and condiment or keep them separate and mix them when they are prepared. Always with the aim of speeding up preparation times, even the frozen pre-cooked pasta market shows interesting increases. Companies are equipping themselves with complete lines for producing this type of pasta with machinery for each single production phase. The production lines of frozen pre-cooked pasta allow producers to obtain a product which has all the advantages of pre-cooked pasta, but with a longer shelf life due to its final freezing. Once the pasta dough has been prepared, it is conveyed to the pasta shapers (dies). It is then pre-cooked in an immersion cooker to partially cook it and it is then cooled to quickly lower the temperature and block the cooking process. The cooled product is then dried with hot air and frozen by means of a freezing spiral. At the end of line, the pasta is packaged. The number of people suffering from coeliac disease is increasing in Italy and all over the world. According to the report drawn up by the Italian Ministry of Health in 2015, more than 180 thousand are suffering from this disease in Italy, compared to about 64 thousand in 2007, the first year the ministry issued the report. This is an important figure, which has led to the creation of a highly interesting market segment for pasta producing companies, that of gluten-free pasta. Modern equipment allows manufacturers to produce products tailored specifically to the needs of people who must follow a gluten-free diet, in various formats based mainly on the use of starch from maize and rice, but also oats, millet and buckwheat, quinoa, amaranth plus various additives. Today, on the market we not only find dry drawn pasta, but also fresh pasta, both filled and unfilled pasta, thanks to the greater dissemination of premixed raw materials. To produce gluten-free pasta made with gluten-free flours or a mixture of the same, the starch present in the flour must be gelatinised, both to make the product suitable to be transformed into pasta and to make it un-overcookable and easily digestible. The raw gluten-free flour then undergoes a pre-gelatinisation treatment. Pasta producing companies can directly purchase flour that is thermally treated in mills, through the process of pre-gelatinising starch, or raw flour and transform it by means of a gelatinisation process performed using suitable equipment. The latter is more complex and expensive as companies must purchase the system and integrate it into their production line. Moreover, the pre-gelatinisation process is not easy and can cause various problems, such as the lack of treatment homogeneity, difficulty of cleaning the machines, a decrease in production capacity and higher energy consumption. Instead, the gluten-free pasta production technology that uses pre-cooked flours requires a smaller investment. 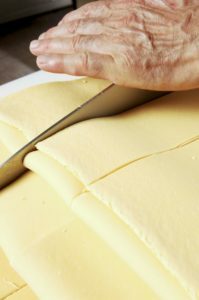 The pasta dough may be pre-cooked on conveyor belts or in the tank. In the first case, the quality of the pasta is better, since the dough does not clump together, heat and humidity are distributed in a uniform manner and the problem of some parts of it remaining raw is avoided. It also allows greater control of the degree of gelatinisation and the ability to better manage the heat treatment times, also in the presence of different flours. There are no complete pasta lines that do not use conveyor belts. This flexible equipment is available in many different solutions, both in terms of dimensions, materials (plastic or stainless steel) and technological features to satisfy the handling requirements in the requested capacities. The belts can be made of strips, with side walls and guides for centring the products. Thanks to the conveyor belts, the pasta passes from one machine to another of the production line in complete safety on any route (straight, curved or vertical), thus optimising the available space. By equipping them with side walls, concave conveyor belts can also convey flours and doughs. Spiral ones can be used to freeze, cool, leaven, dry or pasteurise different types of pasta. These long conveyor belts convey the product from outside to inside the machinery and they circulate it under certain ventilation, temperature and humidity conditions for a set time along a spiral path, without subjecting it to shocks or unnatural movements, which could impair its final quality. The conveyor belts are also designed to distribute the dough neatly on different machines, not only at the exit of the pasta dies, to avoid the product piling up into heaps, thus jeopardising the subsequent treatments, such as drying, possible pre-cooking, but also the final packaging. Retracted belts are suitable for the correct distribution of pasta. They are equipped with a retraction device which makes the belt move just above the previous one. When the pasta has reached the drop-off point, the retraction device pulls the belt back, making the product fall onto the underlying belt, without the product rolling or bouncing about. Therefore, the pasta is kept in tidy conditions for the next treatment.